On the occasion of Christo and Jeanne-Claude: Barrels and The Mastaba 1958–2018 at Serpentine Galleries, Christo talked about works in the exhibition from the last six decades, which also coincides with The London Mastaba, a temporary floating sculpture on The Serpentine lake, the artists’ first large-scale public sculpture in the UK. 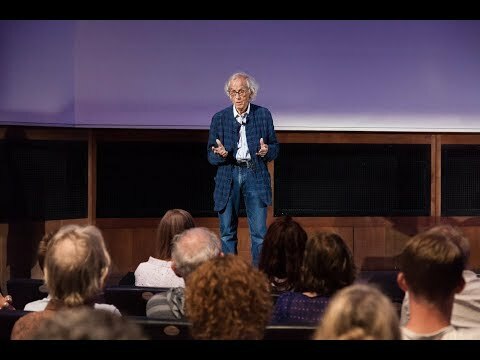 Following the talk, Christo was in conversation with Hans Ulrich Obrist, Artistic Director, Serpentine Galleries, and took questions from the audience. Christo (born 1935 in Gabrovo, Bulgaria) and his late wife Jeanne-Claude (born 1935 in Casablanca, Morocco, died 2009, New York City, USA) are renowned for their large-scale environmental projects and temporary sculptures at sites around the world. Their first artistic collaboration was in 1961, where they created Stacked Oil Barrels and Dockside Packages at Cologne Harbour; an installation that remained for two weeks. Outdoor temporary projects include: The Floating Piers, Lake Iseo, Italy, 2014-16; The Gates, Central Park, New York City, USA, 1979-2005; Wrapped Reichstag, Berlin, Germany, 1971-95, The Pont Neuf Wrapped, Paris, France, 1975-85; Running Fence, Sonoma and Marin Counties, California, 1972-76; and Wrapped Coast, Sydney, Australia, 1968-69. Christo and Jeanne-Claude have completed several indoor installations, including: Big Air Package, 2010-13 and The Wall - 13,000 Oil Barrels, 1998-99, Gasometer Oberhausen, Germany, and Wrapped Floors and Stairway and Covered Windows, Palazzo Bricherasio, Turin, Italy (1998-99) and Museum Würth, Künzelsau, Germany (1994-95). The projects of Christo and Jeanne-Claude have been the subject of international exhibitions and displays including most recently: ING, Brussels, Belgium (2017-18); Fondation Maeght, Saint Paul de Vence, France (2016) and Museum of Contemporary Art San Diego La Jolla, California, USA (2014). Christo participated in the Serpentine Miracle Marathon in 2016. Christo and Jeanne-Claude are celebrated for their ambitious sculptural works that intervene in urban and natural landscapes around the world and temporarily alter both the physical form and visual appearances of sites. The Serpentine Galleries presented a major exhibition of the artists’ work, which drew upon their use of barrels to create artworks. Simultaneously, Christo presented The London Mastaba, Serpentine Lake, Hyde Park 2016 - 2018, a temporary floating sculpture on The Serpentine lake.